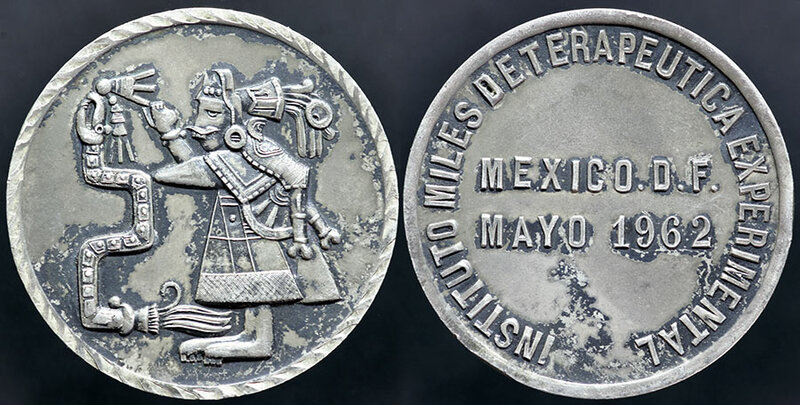 I'm now using this medal as and introduction to the Mexican Pre-Colombian series, although it is not part of the series. This depiction of an Aztec healer is very well done. The medal is for the Miles Institute of Therapeutic Experimentation. It sounds as scary as the Aztec medicine man looks. In hand the silver has a nice sheen and the toning blends much better. Today, the Institute is part of the University of Guadalajara, and Pfizer seems to have something to do with it.